Garter springs are often used as oil seal springs for transmissions and many different products. By coiling a compression spring or extension spring with male and female ends you can join them together to form the garter spring. Garter springs have the following connecting ends. Theirs connector ends, loop connections, and tapered end connections. The main use for garter springs or oil seal springs is to create a seal to maintain pressure within a cylinder. The garter spring or oils seal spring will compensate for changes in pressure and temperature within the object. They can also be used in electrical applications and motor belts. Garter springs are often hidden inside many applications where pressure needs to be maintained, such as the transmission in a car so many times we do not even know they are there. Since garter springs and oil seal springs are created by joining the male end into the female end, or by using connectors or loops on the ends of the garter spring to connect the garter spring ends. It's important that the two be joined with enough force that they will not separate during use. What type of environment will this spring be in? The answer to this question will allow you to determine the correct wire type for your design. Certain restrictions such as temperature or liquid will have a tremendous impact on the type of wire and cost of material. You must know the outer and inner diameter of spring formed ring. Since a garter spring is most often used as a seal, it needs to fit precisely over the cylinder that it is preventing liquid from escaping or entering. 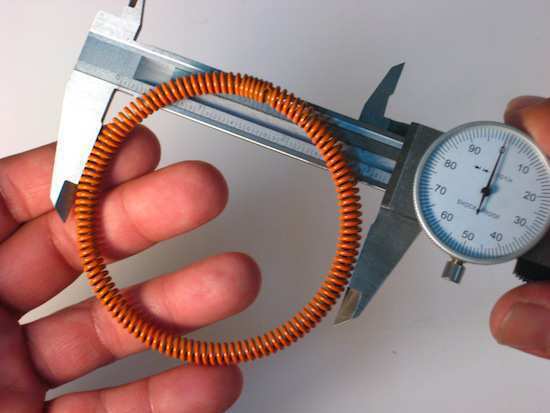 Determine the outer and inner diameter of the Garter spring. Then determine what your coil spring diameter needs to be. You will also have to figure out how much radial force you will need in your seal or application at a given expansion point. You have a 10.000-inch outer diameter and you need to open up the garter spring to an 11.000 diameter thus giving you 1.000 inch of radial travel. At this 11.000-inch diameter you require 50 lbs of force for your garter spring to function correctly in your product. You need a 15.923 lbs/per inch extension spring to do the job. The 50 lbs is your load at an 11.000 diameter or 1 inch of radial expansion but the 15.923 lb rate, which is the master in determining the load at other distances. How do I achieve many cycles of life for my garter spring? The best way to achieve high cycles of life is to make sure that you have a workable index. The index of the spring is determined by taking your outer diameter (OD) and minus one 1-wire diameter (WD) to give you your mean diameter. Then you take your mean diameter and divide that by the wire diameter giving you your spring’s index. Make sure you are using the outer diameter of the spring itself and not the circle diameter. If you have a spring index of 4 or below the spring has a higher degree of difficulty to make, costing you more, and it will take a set quicker causing damage to the spring. Also if your spring index is above 13 the spring will also be difficult to make because it is very flexible (like a slinky) and hard for a spring maker to run off a machine. The optimum index for your spring is 6-10. If you create a spring with an index other than the optimum you can change the wire diameter and outer diameter of the spring to obtain the index you desire. 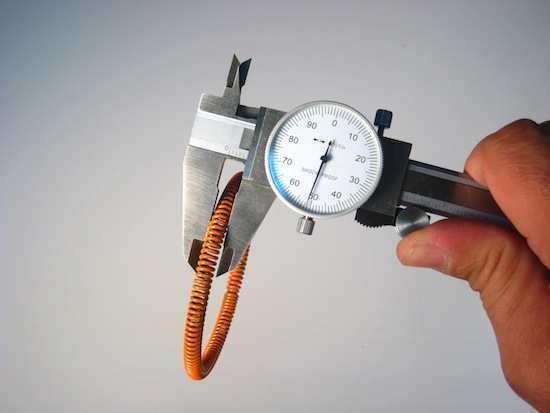 In order to measure a garter spring you will need a pair of dial or digital calipers. You will need to measure the outer diameter of the ring, the inner diameter of the ring, the wire diameter, the inner diameter of the male end and the outer diameter of the female end of the spring. To see how to measure garter springs properly please see the images below. There are many different coating options for garter springs. Some will give the spring a deep cleaning and others may even lower the cost of the spring. For the most part adding plating will add to the cost of your garter spring but some times it is necessary for your application. Some of your plating options are zinc plating, black oxide, nickel plating, electro-plating, and galvanized wire. Galvanized wire is one of the more economical choices because Acxess Spring will purchase the wire pre-coated so we do not have to send the spring out to be plated. The electro-plating will allow you to send a conductive charge through the wire for electrical applications. Acxess Spring has highly skilled engineers available to help you with your garter spring design. When you are determining wire types, load, fatigue, constraints, plating, etc, you can consult our engineers to help you answer some of the questions you may have. Acxess Spring is here to help you from prototypes to production. 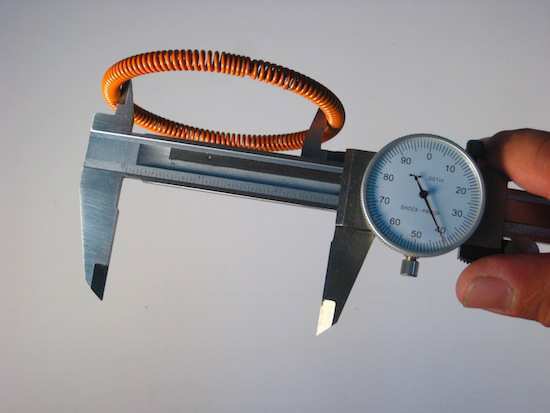 We can manufacture garter springs from 0.006 WD to 0.100 in wire diameter. We are here to service you and we pride ourselves on our customer service.